To celebrate Daz3d's incredible new content management tool, as well as to help answer any questions new user's may have, I will be installing and using the manager as I put this article together. To assist me in this endeavor, I am using a laptop that has no content or Daz applications installed. I will begin by installing Daz Studio 4.5 Pro, and then continuing on with installing my content with this new manager. Sounds fun, huh! Here we go! So I'm beginning my journey into the unknown. The first thing I want to do is to go to the Daz3d Install Manager Info Page, where I can learn all kind of things that, previously, I truly had no clue of. and they aren't kidding... at least from what I can tell by reviewing the resources on this page. A clever page, well laid out and packed with just the information that a newbie, like myself, needs at this stage in the game. There are options for Windows users and Mac users nicely laid out and clear to understand. Helpful videos related to the use you'll be getting depending upon the state of your current content. Before today, I've always used a multiple "Runtime" style of keeping my content straight. Well with Daz3d's "Smart Content" using a special content database known as the "Content Management System", which is currently used in Daz Studio 4.0 and newer - as well as the beta Carrara 8.5, I will be experimenting by letting this DIM install all of the content for this Laptop directly into the default "My Library" for Daz Studio, and we'll see what it does for Carrara content when we get there. The whole appeal to me for doing it this way is simple. First off, I've never liked how hard it was to actually 'remove' content from a 'Runtime' environment. No big deal as I'm used to using it, but now that I can uninstall with the click of a button, why not, right? Secondly, after checking out the way Daz Studio sorts my various content types, I'm really impressed with how easy it has been for me to find all of my goods. As I download the installer, I finish scrolling down the Info page noticing a nice FAQ section with some valuable information regarding its basic use, a link to the Reference Guide, and some more great info with a link to their User Interface Page and although the process looks pretty straight forward, if you need more info on using the thing to download your content from Daz, there's the Downloading with Install Manager (Work in Progress) page. You certainly can't say that they haven't put any thoughts into training us on this, can you. Okay, so I'm feeling more confident than ever. No, really... ask administrator Frank. I was really feeling sheepish about this whole "new Tool" business. What's with that? I should have been all over this right from the start! Especially now that I've taken a closer look via this rather splendid Info Page! Now, if you'll forgive me for a bit, I'm going to go download Daz Studio and install it. Then I'll install this newly installed manager system and get some content coming my way... then I'll report back with my experience. Okay, first of all... This thing totally rocks! No more digging through itemized this or order # that. This thing gives you a comprehensive list of EVERYTHING you've purchased at Daz3d. I was hoping that it had a way to download and install the software, too... but I can totally understand its not doing that - mainly because there's that 'select all' box at the top... something I should have noticed before deciding to start at the bottom of my list (get that Victoria stuff downloaded and installed right away!!!) and checking every box. Hogwash! It was a very nice experience reminiscing over all of those purchases. So anyways, since I didn't have any software installed to run this content, as I mentioned earlier, I began my downloading venture by resetting my DS 4.5 Pro, Bryce 7 Pro, Hex 2.5, and Carrara 8 Pro. What a great experience that is. I think this is going to be the best laptop ever! I've been moaning about not having Bryce installed, and not spending time in DS and Hex... come on... do it Dartanbeck... just do it. No more double-clicky till I'm lost in exhaustion... eyelids drawn to a close and my poor mouse clicking finger is accidentally clicking when it shouldn't just out of some over double-clicky nerve damage syndrome... Nope. This bad boy unit does it all for you. and it all goes where you tell it to go. Let's say that you don't do it like I am. When does a person ever really start over, right? You can set it up to only show the Poser files. So you set those up to install to your various runtime folders, right? So you check the boxes for all of the content that will go into the same runtime and click the Add to Queue button and let it snap! I'm even installing the Poser content into the Daz default directory. It might be weird to get used to at first but, like I said... it's an experiment. It says in the read me for the install manager (see below) that everything this thing installs will register with the CMS of Daz Studio. So any content that has metadata will now work properly in my Smart Content tab. Looking forward to testing out the dawn of a New Era of Daz Smart Processing - no, I really am. You see, a while back, I went nuts on free stuff from all over the web. It's great, it really is. But I ended up with way too much clutter in my runtime folders. I mean, I have a lot of runtime folders, too... but they're still all cluttered up. I'm really looking forward to having this "uninstall" feature. Ready to Download - This is the list of all of your Daz3d Content purchases, unless a filter is applied. Ready to Install - This lists any files that have been downloaded, but not yet installed. That's where you'll find all of the zips that you've downloaded - or you can chose to have the deleted upon installation. These folks thought of everything! Daz3d Devs are truly the best! Install Manager, by default, uses a Different Default Installation Directory than the Daz Studio default. I have a strong feeling that they did this to reduce possible problems - because the installer doesn't recognize content that you already have installed, but it's better than sliced cheese for anything you install using the tool. So this new directory provides a safe place that we've never before used - so it's highly unlikely that such a directory already exists on your system. Check out the Instructions Here and have a look through all of the cool features it offers. User Guide - This section of the documentation provides tutorials, videos and tips on how to accomplish certain tasks. 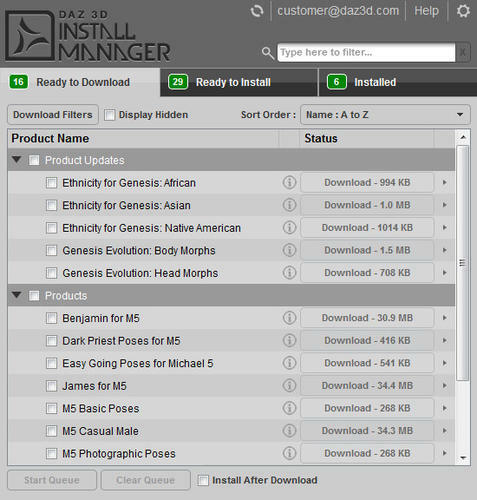 Install Manager is designed to make downloading and installing content purchased from the DAZ 3D store, simple and easy. Install Manager provides the ability to work in either an online or offline mode. While working_online, Install Manager presents you with a list of available downloads and/or updates for your account. It allows you to selectively download all of the items in the list, specific items in the list or each item individually. You also have the option of automatically installing items in the list after it has finished downloading. Whether you are working online, or working_offline, Install Manager allows you to manage whether the products it has downloaded are installed, or not. And it does this in the same manner as the downloads list - all items in the list, specific items in the list or each one individually. And, you have the option to automatically delete the installer once a product has been installed in order to help you manage available disk space. Depending on your specific situation, you may have several accounts that you use to purchase products from DAZ 3D. If you do, Install Manager helps you manage the products from those separate accounts by allowing you to save separate settings for each one. Since you may also use the products you get from DAZ 3D in applications other than DAZ Studio (i.e. Carrara or Poser), Install Manager allows you to set up multiple installation paths and then bookmark them for convenience. And while it can be used successfully with other applications, it has an additional benefit when used with DAZ Studio v4.x and/or Carrara 8.5 Beta, in that it communicates with the Content Management Service (CMS) to install any metadata that the product provides. When used with DAZ Studio 4.x, it also creates a Product container** in the Content Library Pane where you can find all of the user-facing files installed with a product - regardless of whether the product provides metadata of its own. ** This container is not a folder on your hard drive, but an entry in your Content Database, for the purpose of helping you find all of a product's files in one place. The files can also be found in the folders where they actually live on your hard drive. Seriously though. It all began with this horribly superliciously awesome (yes, joe, Awesome!) Install Manager. I've been using this laptop for not much more than playing the occasional game - some sort of geeky Dungeons and Dragons type of thing - you know the type - that's me... also streaming some trailers and/or tutorials and just browsing the web. What a waste. I originally bought this beauty (it has a dedicated GT240M graphics card and a true widescreen 18.2" monitor!) just for Carrara. Now it sits. Well this whole DIM celebration got me to uninstall all the crap from this bad little beast and I downloaded the entire Daz3d Professional Artist and Developer Software Bundle plus Carrara 8.5 beta - and just that one. But contrary to what folks have been saying in the beta thread, I reset the Carrara 8.5 beta product download, and I got build 172! I don't really care, which... I keep every installer I download - but this is a celebration for a download/install tool - and I didn't have anything on this lappy, so I wanted to download everything! Achhht! I'm getting carried away. I talk about that whole thing in my discussion regarding the Install Manager. Anyways, this whole software bundle thing has got me nearly, if not even more excited than the DIM. So I start filling in some generic info in my little low-down run down's on them in here - and I started to get really excited. I couldn't sleep. Still can't - but I'm sure I'll fall over fairly soon! I Have This! I have had this like... since 2007! Why am I not already accustomed to sculpting in Hexagon?!!! Okay. I figured it out. I was wrong. Yes. I was wrong to have not learned how to do this by now. Well if I was wrong about that... Oh No!!! Sure enough. I was all manner of wrong. Well - not exactly. I actually ended up 'acquiring' all of these pretties in my pursuit to getting Carrara Pro. And that I did correctly - absolutely so. But to have all of these great pieces of software is just so cool - I really feel more strongly now, that I'd like to get to know them all a bit better. Perhaps even use them in my work flow - if it works out that way. Heck if it doesn't work out, I've lost nothing but a bit of relaxation time, having fun trying out a great new piece of Daz Softy, right? Right. Well, hey... I have all of these nice Bryce tutorials that David Brinnen so graciously gave us. I could start with a little Bryce time, perhaps! I fired up the first one (two - it's a set) in the list. It's great! I swiftly entered the Bryce forum. I knew he's active... I could spot a thread he's talking in and thank him in person. That's how I got another link to add to our Bryce tutorials page. And I thanked him. He's very nice - and very helpful. You know... I don't need that Bryce tutorials page in here! lol All I need is a link to the Bryce forum. Man! Tutorials here, tutorials there... everywhere are tutorials! Amazing! Thank you for all the time and effort on the Carrara Thread and the other apps in there like you I have them all. I didn't want to cludder the thread and been reading and have probably missed this...I had a question on the Content Install Manager and it seems that some products that are part of Some bundles don't seem to be there? Is that true? I checked my Dinosaur bundle for example and the individual ones arn't there, some of the newer bundles I purchased do seem to be there, but not all. The Other question I had was about content install. I primarly use Carrara. Currently I have a directory called c:\daz then under that I have ext-content (main directory I spent nearly a year reorganizing into a semblance of working well, Male->M4/M3/David/etc-> then M4->Hair/clothing/character/pose/hand/etc). And currently there is no Carrara, Bryce Installer or non model content installer. Okay, you're right about this stuff. There's a lot for them to do yet, I believe... so let's take this in bits - let me know if I miss something, okay? Sorry to hear of bad health. Hope you're feeling well again. Bundles - They say that, if you don't see something that you think should be there, be sure to check "Show Hidden" in the box above the list. I think that they might even just list a bundle, without listing all of its individual pieces, like it was in the downloads page. Not sure. If it is missing stuff, and you know you have it, check your itemized history on Daz3d.com, and let customer service know if its a problem with the DIM. Legacy DS - I wasn't sure, so I thought I'd just get that stuff too. No. This is for those who still use Daz Studio 3 or earlier. Poser stuff doesn't automatically go into your C: Daz3d folder structure. You can set where you want it to install what you're downloading 'right now' and (I'm not looking at it, but I think...) I'm pretty sure that it will save the different locations that you like to install to. So what you would do, is set an install location and the click on any items from the list that you want to go to that location. Make sense? In order to do this, you have to click the little gear in the upper right corner and set up the install point. For my Runtime structure, like yours, I'm still doing it the old fashioned way. Downloading exe. files from my account at daz. I ran the install manager, because I didn't have any of this on my laptop - so I wanted to get everything! This is where it works best - because then it can manage all of your content for you. In this situation, I'm going for Genesis and Carrara 8.5 (for the future). So I'm installing all of that stuff (including ALL of my Poser content) to that default directory, and using the Daz Studio library system to keep it straight - and to try the use of Smart Content. Carrara, Bryce, Hexagon, and any content that is specifically design to work with them, are not going to show up in the Install Manager. Any plugins, Carrara scenes, like Howie Farkes, Phillip Drawbridges Starships, etc., are not in the list. I have a feeling that they're working on this stuff - but it's not yet supported. This is fun. I need to stop for a bit. Look through what I wrote so far, and let me know if I missed anything. I hope I didn't, but if I did, let me know right away, and I'll get into it! One of my granddaughters is studying graphics in college and is interested in this scholarship. Where can she find out more, such as how to apply? DAZ 3D is offering a $1000 scholarship to 3D Graphic Design Students seeking financial aid for tuition, books, and education related costs. Legal residents of the USA currently enrolled at an accredited university or college. A winner will be chosen and contacted by August 1, 2013. Submission deadline is June 1, 2013. I was looking through your Carrara 8 information thread and was wondering how you did the motion blur effect in this image. I animated the guy falling into Rosie. I used layers in Photoshop for just the animated guy - carefully erasing the whole image all around him, except for himself and the blur with the main render underneath. Some of us do what we can in Carrara to minimize the need for 'other application' intervention before the work of art is to be considered finished, while others know how to take the necessary steps involved with the render room to actually 'set up for' continued work outside of Carrara. There are many forms of Post Work, so I intend for this category to grow over time, with some very useful links to various articles within the forums and other sources. Evil Producer leads a discussion that begins with the question of whether to wait for Carrara to produce its own Depth of Field calculations and Blur effect, or to use Carrara's many built-in features to assist in applying an Effect in Post. PD Pro Howler is fast digital painting and animation software created by an artist for hobbyists and professionals alike. This link takes you to a thread I began while considering to add this software to my work flow. Within the thread are many links to tutorials and plugins for the software - as well as the Purchase Page at Daz3d and to the PD Official Site. Brainstorm Mapping Software Dartanbeck, have a look at this. Its PC based and free. Keeping a collection of small or middle sized noteswith links on some area which expands as needed. Such a collection of notes is sometimes called knowledge base. Essay writing and brainstorming, using colors to show which essays are open, completed, not yet started etc, using size of nodes to indicate size of essays. I don't have one map for one essay, I have one map for all essays. I move parts of some essays to other when it seems appropriate. Keeping a small databaseof something with structure that is either very dynamic or not known in advance. The main disadvantage of such approach when compared to traditional database applications are poor query possibilities, but I use it that way anyway - contacts, recipes, medical records etc. You learn about the structure from the additional data items you enter. For example, different medical records use different structure and you do not have to analyze all the possible structures before you enter the first medical record. Commented internet favorites or bookmarks, with colors and fonts having the meaning you want. I don't know if you have seen FreePlane, its based on the Freemind (above) Codeset but has an expanded feature set still free. Freeplane is a free and open source software application that supports thinking, sharing information and getting things done at work, in school and at home. The core of the software is tools for mind mapping (also known as concept mapping or information mapping) and using mapped information. Freeplane runs on any operating system that has a current version of Java installed. It can be run locally or portably from removable storage like a USB drive. IrfanView is a very fast, small, compact and innovative FREEWARE (for non-commercial use) graphic viewer for Windows 9x, ME, NT, 2000, XP, 2003 , 2008, Vista, Windows 7, Windows 8. It is designed to be simple for beginners and powerful for professionals. IrfanView seeks to create unique, new and interesting features, unlike some other graphic viewers, whose whole "creativity" is based on feature cloning, stealing of ideas and whole dialogs from ACDSee and/or IrfanView! (for example: XnView has been stealing/cloning features and whole dialogs from IrfanView, for 10+ years). John really enjoys using Carrara for CAD work. He also uses it with a 3d printer. He wishes for just a few things to make his experience better. There is some impressive stuff going on with Carrara all the time - especially when it comes to those who use it! In this series, I'll be highlighting various individuals regarding their endeavors in the exciting realms of Carrara - And I'm not using any sort of Hierarchy or rational order. If something moves me into writing, then so it is, and so it shall be. This place should be used as one of your home pages, If you use Carrara and your browser supports multiple tabs as a homepage. Seriously. If you're interested in plugins for Carrara - and you need to know who has them, what they're about - she has a nice article in there explaining some of them, but she has the complete Carrara plugin Links list. Most complete list I've ever seen. And who better to talk about them? Holly is good at Carrara. When she jumps in to help answer a question you have, know that you're getting some excellent advice. I really wish I was one of those Batrillionaires or something, I'd see if I could hire her to write tutorials all day and just work on her site - because it's a very cool place. Have you ever seen some of her tutorials? They're great! And she's now adopted this super-awesome comic strip style for them. Very cool! Great art, excellent freebies, brilliant advice, and just an all around cool Carraraist. Wendy is really fun and outgoing - as I'm sure you've all noticed by now. She must have an incredible powerful computer or a whole lot of patience... probably a whole combination of those and more - much more! I say this because of some of the stuff she does as she pushes the envelop on everything. Her work with Carrara is different. I'm not experienced enough to explain it, so I'll be updating this as I figure more stuff out - but she's definitely not a simple "Plug and Play" sort of artist. She tears things apart so she can put them back together differently. She'll take any (or all?) of Howie Farkes scenes, set the trees, yeah.. all of them, to rustle in the wind and record some really long walk-through style animations. Often with a crazy surprise somewhere along the way! Her YouTube channel, Do Not Click - by wendy♥catz is brimming with activity and I don't know if she ever sleeps! How else could she get all of this done? It's always a treat when we get paid a visit to the forums by our very own Carrara Master and Professor, Mr. Phli Wlkes. Phils has several exciting Products in the Daz3d Store and is the video narrator/instructor in the ever-so-incredible Carrara 8 Training Videos from Infinite Skills. Now take an adventure through his many experiments and discoveries in Phil's YouTube Features, where you'll see imaginative animated clips, dynamic cloth and hair experimentation, and other fun videos. Steve K is a 3d animator using Carrara software to create some fascinating entries for 48 hour film contests and the like. This link should launch a nice playlist of his animation videos on YouTube. Either watch them all in order, or select them individually from the list on the right. Most entertaining videos and Steve K is also an active member in our forum as well - helping us as we all learn and grow together. Thanks, Steve K, for all of your efforts! Musician, Animator, Director... but wait, Steve does a whole lot more! I could go on about how generous he is, giving up gobs of time to record video tutorials about techniques for 3d Art, animating, saving resources, etc., Or I could ramble on about how cool his Carrara 3d animated episodes are, or how great a musician he is... nah. For the time being, I'll let his videos do the talking! Check this out! Always looking forward to new videos Steve! His renders and animations are seen across the forums, and his never ending help and support helps all of us to grow in this seemingly limitless endeavor that is Carrara 3d. Speaking of 'helping us all', GK Dantas has played an enormous impact for much longer than when I've been around - as much of his helpful guides were already here when I got here! Still even helpful and a true Carraraists friend! ManStan has been doing a lot with softbody physics within the beta, and probably the official release versions as well. Every now and again, he'll turn us onto one of his renders - he does an excellent job. Check this out! Always a bright light where you're least likely to expect it - but glad to have it once it comes... Kevin is a friendly and knowledgable fellow who is always as willing to help as he is to learn and will often join in topics and enhance them by expanding upon either the question or the topic. I've learned a lot, simply by having him join in. Always a welcome smile to any Carrara thread! Like everything around here, this is a work in progress. Please be patient. Course Duration 10.5 hours - 118 Videos. 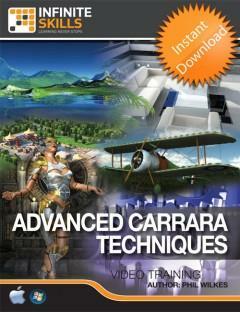 Carrara 8 is a well respected 3D modeling software package from DAZ 3D. In this Carrara 8 tutorial video, expert instructor Phil Wilkes introduces you to the program starting from the basics of exploring the interface, and then quickly jumping into functional instruction on how to apply the power tools this software has to offer. Taught using the latest in video based training technology, Phil covers topics such as cameras and lighting effects, rendering, primitives, hair, shaders and more. 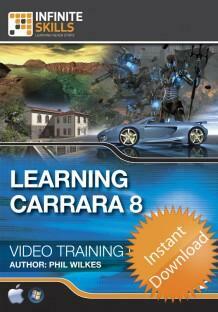 He also introduces you to the new puppeteering and bullet physics features included in Carrara 8. Once you have all the operations down, you will put it altogether in a few final projects that re-enforce everything you have learned in the tutorials. By the completion of this video based training course, you will be fully versed in the operation of Carrara 8, and completely comfortable animating your own figures, and creating your own environments. Work files are included to allow you to follow along with the Carrara tutorials. Course Duration 9.5 hours - 105 Videos. In this training video for the 3D modelling software, Carrara, expert author Phil Wilkes picks up from where he left off in his beginners title for Infinite Skills. This tutorial is a look at advanced techniques for creating objects within Carrara. Phil starts with the a quick overview of managing resources, preferences and other housekeeping items. From there, he jumps right into UV mapping, which is utilized extensively throughout the training course. Covering subjects such as movement, constraints, shaders and texturing, you will dig deep into the capabilities of this software. Phil covers much requested subjects such as creating and modelling your own clothes, and creating and rendering full scenes. This course is not for the beginner, and you should be comfortable with the basics of using Carrara before jumping into this training course. Hello and welcome to the Carrara Information Thread. I plan to keep this up with the current versions as much as possible. This work is planned to be a rather enormous wealth of helpful tips, instructions, and links to valuable conversations in the forum so they are easily found without having to hunt through pages of forum thread titles trying to find the right one for your particular query, so... here it is. The magic behind this whole thing comes from the amazing generosity of the Carrara Discussion Forum members right here, always willing to help with whatever may come up - even if it means duplicating the situation on their own copies of Carrara to help figure out a solution. This has been going on for years - and so I am grateful that the Old Carrara Forums are still available. Unfortunately, none of the images are there - which actually removes much of the help offered. Nonetheless, we have a long future ahead of us, and one of the most unique 3d applications of it kind - if not the only of its kind. Years of discoveries from before us to whatever may lie ahead is an exciting notion - and we can all enjoy the ride together, thanks to everyone here, in our wonderful community. From the newcomer asking fresh questions to the seasoned veterans of solving any issue that arises, and everyone in between. We all make this whole Carrara world turn at a balance that never falls. It's fun to watch the 3d times from various sources. See what the rest of the world is doing and finding ways to perform such feats in Carrara using nothing more than what we have installed, from Magaremoto's, Howie Farkes' and Mike Moir's trees and landscapes to PhilW's, Tim Payne's and Dimension Theory's(Jeffrey Felt) skies, to Fenric, Sparrowhawke, DCG, Inigoni plugins, the Sci Fi Styling's of 3D Lust, to Digital Painter's presets and brushes... the list goes on. In Carrara, if you have the will, you'll find a way. It's all a big illusion. A trick of the eye of the viewer. Already this thread is loaded with enough material to keep your imagination filled with various techniques to help pull it off in the beautifully relaxing (and fun!) interface found within Carrara. I try to write as much as I can, from my own experiences using the software on a Windows platform run on a custom workstation that I built specifically for Carrara 8 Pro. I know absolutely nothing about the Mac OS. So if anyone wants to collect information in that area and post links to help Mac users, I'll get them edited into the Table of Contents and links sections for all Mac OS users to easily find. There are also a lot of areas within Carrara I have yet to explore in any detail - as I am fairly focused towards animation using content from Daz3d. If there is an informative thread going on that you feel should be cataloged here, drop in a post. In my exploration, I have only recently acquired my workstation. So I had to optimize everything I did to get 6+ second animations completed in a reasonable time frame. Along the way I've become a huge fan of Carrara. Working with shaders is a dream for me, in this software. If you happen to invent the need for a new model that takes twenty-two minutes to make, you don't even need a texture map to create a convincing appearance right on the spot. We'll look at this stuff when I can. Setting up lights to allow for renders of low accuracy turning out looking great and efficiently allowing you to move on and keep that story moving. We'll be looking at that, too. I have truly found Carrara to be one of the few things that I like to do on my computer. That and writing. So I'll put the two together and see what we can come up with together and along the way we'll index the forums and have some fun! Here I shall attempt to provide links to the entire set of CMP threads in one place. It's a little unfortunate that the discussions are so vastly spread out, but at least with a consolidation of thread links, we can find peace amongst the chaos. Poll: We’ve been busy at work thinking on story lines for the Year 1 Project. Please vote for your favorite story line. Below the poll you will find a synopsis of each of the story lines as I understand them so far. Please review the synopsis and vote on your favorite. I have presented the ideas in the order in which they were proposed. Hey Carrara’ns , some of you may know about the “Carrara Community Movie Project” which aims to showcase Carrara Studio’s strength as a 3d program. We are starting with a short “dry run clip” to iron out the bugs and we are looking for volunteers . If you’re interested in helping, this is a great way to learn and improve your 3d skills, I find projects like this can really push your skills forward, it can be hard work but very rewarding..
As you may have heard the buzz developing, I have gotten the crazy idea into my head that what we need around here is some work to do, a project that focuses us on the positives. We all have to start somewhere, right? This set of articles is designed to help familiarize our fellow Carrarartists with the friendly, yet powerful interface and tools that make up Carrara. This initial post will act as a table of contents for the walkthrough itself, so that the entire work may remain coherent in a forum thread atmosphere - so the walkthrough will include helpful links to help the readers navigate to where they'd like to go next. Make you content look as it should. I’ll begin with the quick and easy methods of correcting the appearance of your models. For those so inclined, I then continue on with a few levels of better understanding within the texture room. The work on my Carrara Walkthrough has only just begun. Check back for more helpful articles. Getting around in the Carrara Browser is as simple as clicking through nice, large tabs and adventuring through all of the various categories within. The Native Content package that ships with Carrara is the magic behind filling your browser with content and the magnificent structure of its navigation categories - and it also contains the Wizards available for various tasks wherever you see that you can use a wizard. In other words, if you don't install the Native content, You browser categories are vastly less significant, and you won't have access to any of the Carrara Wizard tools. This article is all about creating your own, personal filing system to which you can easily save anything that you want within Carrara. Since we all use Carrara in our own way, this custom browser ability is an amazing feature - making it possible for you to make it any structure of organization that works best for you! If you open Carrara and have a look at the browser window at the bottom of the scene, you'll see an assortment of tabs along the top of the window, leading you to various types of content that can be contained within Carrara, which covers an enormous range of file types. Right now I would like to focus on a custom organization system that you create yourself according to what you'd like to work with and save within Carrara - in the browser. Since most of us will eventually have the urge or need to save objects, let's move to the object tab. If you have a "My Objects" line in your browser's Object tab, move on to the next Paragraph: ◄ Folder Structuring ►. If not, let's fix that right now. Please don't move on until you can open Carrara and find My Objects listed at the top of the Objects tab. Inside your DAZ 3D > Carrara 8 folder, open My Presets. If this folder doesn't exist, create it now. Within My Presets, open My Objects. The My Objects folder will likely be empty unless you've saved something into it already. Know now that .car files created from Carrara can be moved anywhere without breaking - unlike some other applications. So if you create a new folder structure that you really like, you may feel free to organize content that you've already saved from Carrara into this new structure. You can see how we can easily create a nice working structure in here. Please keep in mind that you really only need to have a simple starter file system, and let your needs create the rest. I'll explain that: Once you have a base system of folders, you cane easily add to the system during a "Save As" operation, and create new folders according to your needs. Save As will store the whole scene. However; In Carrara, if you already have a folder in place, you may simply drag whatever you want to save from the Instance Tab (The box on the right side, under the word: "Scene") directly into the browser, completely avoiding to store lights, cameras, scene information, whatever was not in whatever it was you dragged to the browser. Neat, huh! So let's stop right here so I can explain a little further. This My Documents folder system doesn't affect the "Scenes" tab in any way, for some reason unknown to me. If I find out, I'll report an update here. Therefore, I create an entire "Scenes" directory within My Objects instead. So when I open the My Objects category at the top of my browser, I also have a "scenes" category in there that further opens into a vast structure of many vague scene type that I create and save. It is the My Objects tab that contains most everything that "I" save in Carrara. I have folders for Light rigs, Effects, Vehicles, Buildings.... in the main character folders with my People folder, I have further folders for Clothing, Weapons, Accessories, Action Shots, Versions (where I save different configurations of that character), etc. And I'll do nearly the same for the ultimate bad guys as well. This system becomes very powerful, and completely sets Carrara apart from all other content use applications. And it's important to save things once you've set them up in Carrara. Carrara has an amazing render engine and shader system that is slightly different from others - so many shaders will need at least some degree of optimizing to render properly. Something I'll be discussing when we get to the Shader Room. I take this thought much deeper. Each of my main characters get their own custom light rig (also discussed in detail later) that only affects the character it's attached to. This rig only provides highlights to make them stand out as heroes - and works well with other scenes I've saved. In Carrara, Ctrl G creates a group of whatever you had selected, even if it's only one object. I create a group that is named the first name of the hero which contains the hero figure, it's clothing and accessories, light rig and cameras with dramatic angles and named appropriately so they are never the same name as any other camera in any other scene. This is really easy when you get used to it, like I'll explain in just a minute. The My Objects folder itself is also a useful place to keep things that you load often in Carrara. Mine contains a scene called "1280 x 720 Blank". Instead of ever using File > New, I just touch my 'Objects' tab and right there is "1280 x 720 Blank", and a few others. "1280 x 720 Blank" loads a scene with two cameras, the default light and all of my favorite default render options all set and ready to go - and is otherwise a brand new, empty scene. the name gives it away, that it renders to 1280 x 720 resolution, and I've also set a default format and camera, rather than Carrara's default BMP output setting. I also have one called "Character Template" which includes a group called "Name goes Here" which contains my Character highlights light rig all set to only affect the group: "Name goes Here", so that it's all set and ready for me to add a new character model. By the time I rename the name of the group and the lights, everything is easily, already unique, as mentioned just a minute ago. I have certain backgrounds that I use over and over - because the focal point of the scene makes the background far less important on those scenes which use it. It only makes perfect sense that I optimize the lighting and set up a few default filming cameras and save the scene in an easy to reach location. Then I can use that scene as my blank and populate it for an incredibly quick scene creation process. Since I've optimized the lighting for that scene, I give the lights good names, group them (Ctrl G), which also gets a good, descriptive name like: "Mid Day Overcast Light Rig" and drag that group into my "Lighting" folder in my My Objects collection. Anything and everything that I think might be of use later on, I save in this manner. If it's a whole scene, I perform a Save As and get it into that same structure so I can drag it in at any given moment - or double-click it to start off with it. When you decide to buy Tim Payne's Skies for Carrara, and Dimension Theory's Carrara products, they'll teach you more about the power of some of the other tabs in Carrara, if I don't beat them to it when I return to finish this article. Until then, I think you should have plenty to keep you busy for now. If not, and you need to know earlier... send me a PM and I'll get you where you need to be! Okay? Okay. I would like this to be one of my next updates. As with the Shaders Walkthrough series, I'd like to do this one in video - as I feel it will build a better understanding if you can "See" what I'm doing and talking about. Make you content look as it should. I'll begin with the quick and easy methods of correcting the appearance of your models. For those so inclined, I then continue on with a few levels of better understanding within the texture room.